It is 100 years since the founding of De Stijl, a movement of artists, designers and architects who came together to develop a new visual language. From 10 June, Gemeentemuseum The Hague is presenting the exhibition Architecture and interiors. The Desire for Style to mark this centenary. The exhibition has been compiled in close cooperation with Het Nieuwe Instituut. ‘For the first time in an exhibition about De Stijl, we will be looking back beyond the First World War,’ explains Hetty Berens, curator at Het Nieuwe Institituut. J.J.P. Oud and Th. van Doesburg (tile floors). Huis De Vonk in Noordwijkerhout 1917. Holiday home for factory girls with an interior of smooth walls and hygienic, tiled floors. The floor design with black, white and yellow-ochre tiles is by Th. van Doesburg. Collection Het Nieuwe Instituut, OUDJ ph96. 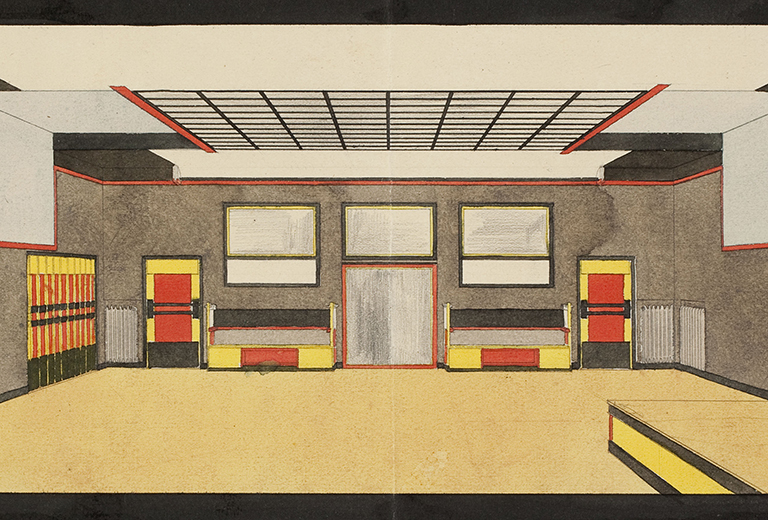 The integration of different disciplines was essential to De Stijl, Berens explains. ‘Fine art and commissioned design came together in De Stijl. You can also see how different scales were integrated: from buildings and interiors, to pieces of furniture. This striving towards the Gesamtkunstwerk, the total work of art, also appeals to the imagination of today. These architects, designers and artists wanted their uniform and abstract visual language to transcend individual differences and contradictions to improve the world. In this sense, De Stijl was certainly a response to the First World War. J.C. van Epen. Watercolour study of a country house, [n.d]. Collection Het Nieuwe Instituut, EPEN t290-5. The colour palette of orange, green, purple, blue and yellow binds the landscape and architecture together. Van Epen exhibited his work in exhibitions by the artists’ group De Onafhankelijken from 1912 at the Stedelijke Museum Amsterdam, in which Mondriaan also took part. The use of steel also had a major influence on the new visual culture that was developed by De Stijl and, later, Dutch functionalism (Het Nieuwe Bouwen). Berens points to the example of the grain silo by Michiel Brinkman in Rotterdam, for which he designed an enormous skeleton construction of tightly ranked rows of iron columns. In fact, the influence of technical innovation on visual culture continued up until the Second World War, Berens explains. ‘You can even see some of the same designers among the Dutch Functionalists. For example, the colours used in the Sonneveld House of 1933, designed by the architects Brinkman and van der Vlugt, were the same colours De Stijl artist Bart van der Leck had composed for the Amsterdam department store Metz & Co. The same blues, reds and yellows were used in the dining room, and blue and yellow were used in the children’s bedrooms where, this year, we added red chairs upholstered in fabric from the Van der Leck series. Berens says that the partnership between The Hague Gemeentemuseum and Het Nieuwe Instituut has been very enjoyable. It didn’t take long at all for them to agree on the idea underlying the exhibition. Because this year marks the centenary of the movement’s genesis, several art institutions are holding exhibitions on De Stijl. Utrecht’s Centraal Museum and Kade in Amersfoort both approached Het Nieuwe Instituut to borrow drawings and maquettes from the archive. Berens stressed that there is plenty of material to choose from. ‘We are in a position to be able to lend artefacts liberally while still retaining enough to put on an extensive exhibition ourselves. Some institutions had to wait a little while we made our selection for The desire for style, but there was still more than enough to draw on. The wonderful advantage of an extensive archive like the State Archives for Dutch Architecture and Urban Planning is that you can graze in it time and again, each time from a different angle, and still discover new items or make new selections.